Dealing with a lot of dropped calls as you move from room to room in your home or workplace? Battery running out because your cell phone is always roaming in search of a signal? These are common issues in remote areas where cell phone signals are weak. One way to solve them is to shop for a cell phone signal booster. With a booster, you have a relay between your cell phone and the tower transmitting the signal you are trying to pick up. It gives the signal a boost so that your phone can pick it up. Interested in getting a cell phone signal booster, but not sure where to begin in your search for the right product? Check out the best cell phone signal boosters in the table below. Still not sure what kind of booster you should buy? Read on to discover important questions you need to ask and key features you need to shop for to ensure you are getting the most suitable product for your needs. A cell phone booster is a device you can install in your home, workplace, or vehicle. It is able to boost your cell phone signal so that you can communicate more clearly, waste less battery power roaming, and experience fewer dropped calls. Boosters are available for small, medium, and large spaces. Different boosters are compatible with different carriers and signals. It all starts with an antenna which is installed outside. This antenna is powerful enough to pull in the signal from the nearest cell phone tower. The signal booster than amplifies that signal and re-broadcasts it using an inside antenna in your home or workplace. It is then easier for your phones to pick up on that signal throughout in your home or work environment. What coverage area are you looking for? As previously mentioned, coverage for cell phone boosters can vary, with models available for small, medium, and large spaces. Before selecting a product, ask yourself what area you need to cover—for example 100 square feet, 150 square feet, 600 square feet, 1,200 square feet, 1,500 square feet, 5,000 square feet, or so on. Keep in mind that the exact coverage you will achieve will depend in part upon how strong your outside signal reception is. With just 1-2 bars, you might get 150 square feet from a product which could deliver 1,500 square feet with 5 bars. Where are you planning on mounting the booster? Some people install boosters on stable property, because they are looking for a way to boost a signal at a home or at a work site. 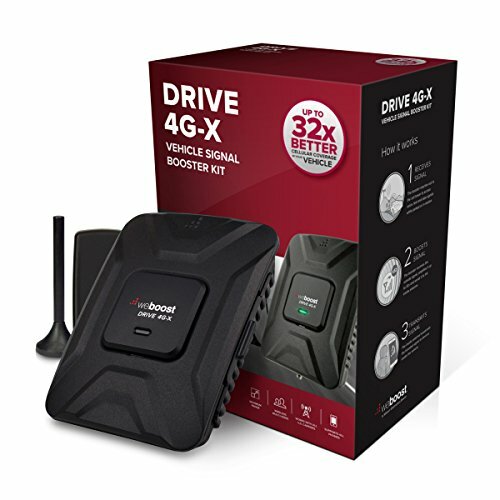 But you can also buy a cell phone booster for a vehicle such as a car, truck or RV. Make sure that the model you are getting is designed for installation where you plan to operate it. Will you be using the booster for personal or professional use? You also should think about not just where you will use the cell phone signal booster, but how you will be using it. Are you trying to get a stronger cell phone signal throughout your house so you can eliminate dropped calls? Are you attempting to boost a signal while working in a remote area such as an oil field? Are you getting it for outdoor activities? All of this will impact what you need to look for. Both omnidirectional and mono-directional antennas are available, for example, and as previously mentioned, different coverage and mounting options are as well. You need a very different product to boost the cell phone signal in one room of your house than you do to ensure that employees walking around a remote worksite are able to communicate. This is very important. One of the biggest purchase errors you can make is buying a cell phone signal booster which cannot support the carriers and networks you need. While many systems can support a wide variety of carriers, there are others which only support one or a few. You also should do some research on signals operating in adjacent bands in your area, as these can sometimes cause interference which results in certain boosters not working properly. It takes a few steps to install a cell phone signal booster, regardless of where you will be using it. In general, you begin by locating the strongest cell phone signal you can access outdoors, and then you mount the outdoors antenna, pointing it in that direction. You then use a cable to connect that antenna to the booster, after which you set up the indoor antenna to act as your relay. Needless to say, this installation process can be simple with some products and complex and challenging with others. Shop for a product with fast and easy setup, especially if you are a novice with communications technology. Some products include a feature to automatically adjust the signal on an ongoing basis to ensure that you receive the best performance. This is done using a combination of microprocessors and software. This feature would likely be most important in a situation where you will be moving around a lot (if for example you are installing the booster on your RV). The build and strength of the antennas used for the booster are also essential. Systems which use weak antennas may cost less, but they also deliver less of a boost. Sometimes it is worth paying a little more for industrial-strength antennas which can deliver superior performance. Note that you will need to decide whether you want an omnidirectional antenna or not. The benefit of an omnidirectional antenna is that it is easy to set up and you do not need to aim carefully in order to pick up the cell tower signal. The drawback is that there are higher chances of interference from other antennae. There are boosters out there which can only support one user at a time (usually a login of some sort is required). That is fine if you are going to be the sole user. But if you have multiple household members or workers who will need to use the system simultaneously, then you require support for multiple users. Another thing to be aware of is that there are cell phone boosters which rely on subscription plans in order to work. That means that you might need to pay a monthly or annual fee. There may also be associated carrier charges for certain plans as well. If you stop paying those continuous fees, you lose your boosting service. Other products however do not require that you purchase a subscription of any sort. You pay a one-time fee to purchase the booster, and then it is free to use for as long as it continues to function. Obviously if you want to keep your expenses down, this is what you should aim to buy. Of course, there may be situations where you find that other factors outweigh the drawbacks of these costs and a subscription-based booster is still a worthwhile purchase. It is up to you to assess your needs. Finally, customer support is something which is important anytime you make a purchase, but it is more important than usual when it comes to buying a cell phone signal booster. Why? Because cell phone signal boosters can be pretty technical. It is not uncommon to encounter questions or problems during the setup process involving carrier compatibility, signals on adjacent bands, and so on. If that happens, you will be glad you chose a product from a company which is fast, responsive, knowledgeable, and helpful. You may need someone to troubleshoot an issue with you step-by-step, and a smart, accommodating team of representatives can make all the difference in the world. Now you are familiar with the most important features to look for and questions to ask when you are shopping for a cell phone signal booster. Let’s take a look at reviews of some of the top products on the market right now. This cell phone signal booster is able to provide up to 1,500 square feet of coverage. It is compatible with all carriers in the US and Canada, and is manufactured to be fast and easy to install, even for novice users. Wide compatibility. 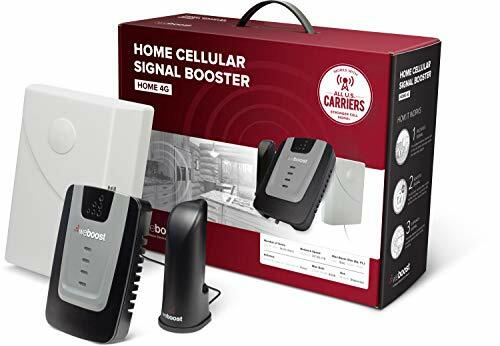 No matter what carrier you use, it is likely that the weBoost Home 4G cell booster will be compatible. Compatible carriers include Sprint, Verizon, AT&T, T-Mobile, U.S. Cellular, Straight Talk, and others. Automatic gain settings. 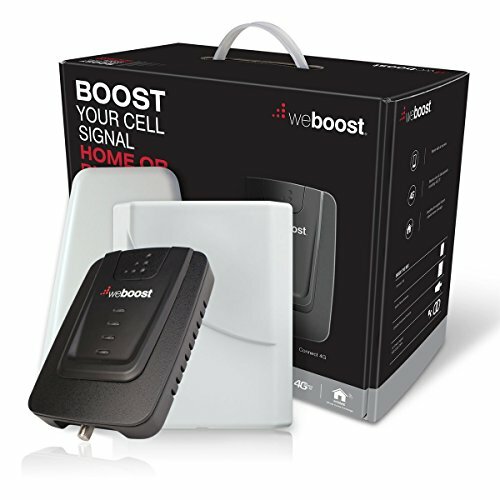 There is patented smart technology included in the weBoost Home 4G booster which keeps track of your cellular environment and makes automatic adjustments as needed in order to keep performance to a maximum at all times. Battery life is increased. This product can provide you with up to 2 hours of extra talk time in areas where your phone usually has to roam for signals. Setup is simple. Everything which you need to get started is included in the package. If you are in search of a “plug and play” solution, this is it. With correct installation, you can get excellent results. Even though installation is relatively straightforward, it does take some time and dedication to get an optimum setup (this is par the course with boosters). Once you do, you should find that you get great reception. Reception can drop during poor weather. This is expected, however, and is blatantly mentioned by the manufacturer in the manual. If the weBoost Home model above appeals to you, but you are looking for broader coverage, you should look at the weBoost Connect. The Connect offers a coverage area of up to 5,000 square feet, making it a better choice for a larger house or workplace. Excellent compatibility. The majority of US and Canadian carriers are supported by this device, including Sprint, Verizon, T-Mobile, U.S. Cellular, and Straight Talk. Automatic gain. This feature continuously adjusts for changes in your cellular environment. That way you will always get the strongest signal possible. Plug-and-play. Like the Home version, Connect features plug-and-play functionality with fast and easy setup. Powerful directional antenna. The antenna included with the Connect is directional. This does mean you have to put some effort into aiming it properly, but it also tends to increase separation. This can reduce interference between the indoor and outdoor antennae. High-quality coax cable. Quality can vary significantly between the coax cables which are included with cell phone signal booster kits. The quality of this coax cable is higher than most, which makes a substantial difference in performance. With other kits, you might have to go out and buy another cable to get the performance you are after, so this also saves you money. Amazing customers service. One of the best things about any purchase from weBoost is that the company itself is incredibly fast, responsive, and dedicated when it comes to handling questions and concerns from customers. So if you do encounter issues during setup (see below), you can be assured that this company has your back. There may be issues involving conflicting signals. In some locations where different carriers are using adjacent bands, the device may “overload,” resulting in a gain problem. Finally, weBoost does manufacture a cell phone signal booster for cars, trucks, and RVs. 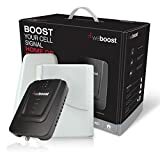 weBoost Drive even bears a stamp which says, “Trusted by first responders to keep call signals strong.” So this is a reputable device favored by professionals who cannot risk losing their connection cutting out at a critical moment. Compatible with most major US networks. This includes Sprint (with caveats, see the next section), AT&T, Verizon, T-Mobile, U.S. Cellular, Straight Talk, and others. Like other weBoost products, cell signals can be boosted 32x. This can be a big help when you are on the road in remote places. Setup is fast and easy. Even users without a lot of experience with cellular technology should be able to handle the DIY setup process with the help of the manual. All the components which you need to get started are included with the kit you purchase. Your purchase is backed by a strong guarantee. When you buy weBoost Drive, you get a 2-year warranty from the manufacturer along with a 30-day money-back guarantee. That is plenty of time to test out the system. Extend your talk time. Get as much as 2 hours of extra talk time when you use weBoost Drive. Your phone no longer has to roam. Reliable and responsive. This product does a great job adjusting to changing cellular environments while you are on the move. That way you can enjoy great reception wherever you go, so long as you are within range of a cell tower. Customer support is great. weBoost is renowned for the quality of its customer service, which is fast, friendly and dedicated to providing help, even with complex technical questions. There seem to be compatibility issues specifically with Sprint LTE. So if you are using Sprint LTE, you may want to consider a different model of booster.